As well as being a renowned karate instructor, Sensei Evans is also a qualified judge and referee of national and international standard. 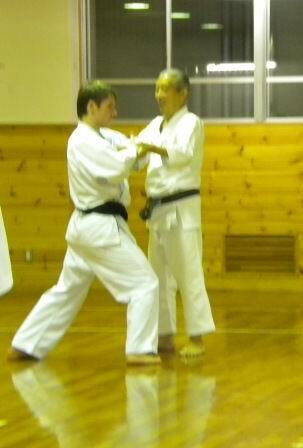 Sensei Evans has practiced Wado karate for over 40 years with many of the worlds top Japanese instructors. Sensei Evans teaches at all of our Welsh dojos. Senior WKU instructor and former national kata champion. Sensei West has practiced karate for over 30 years at the highest level; he has represented England in both kumite and kata. Sensei Steve teaches regularly in our dojos in Chiswick and Ealing west London. He also oversees the children’s classes at the Hogarth, and schools in Ealing. Sensei Kate Williams has been a student of martial arts for over 20 years. She is a former England representative in kumite and kata. In 1994, Kate became national kumite champion and in the same year represented England as a member of the Wado fight squad in the World Wado Championships, in Japan, where she attained third place in kumite. Kate trains and teaches regularly at our Chiswick dojo. 3 times Polish Champion and vice European Champion in Full Contact Karate. Sensei Jakub has concentrated on developing ki training. He is presently performing demonstrations around the world on the possibilities of the “Human Organism”, which incorporates the development of will power, kime and the focus of energy and internal power. His demonstrations have been enthusiastically attended in Poland, Germany DSF Sport, Eurosport and Italy Rai Uno. Sensei Jakub teaches and trains at our Chiswick dojo. Sensei Dave Betts has been a martial arts student for over 25 years. He is well respected in Karate and the martial arts. He is particularly interested in researching the body movement and bio-mechanics and the use of body dynamics in Karate. The centre owes much to Senseis Clampin, Lucas and Butler for the high standard of Karate amongst the junior members, because of their continual and dedicated instruction to the children. Eugene's entheusiasm and dedication to Sensei Heap and the WKU has encouraged the karate practioners he trains with. He has travelled and trained extensively in his determined quest to seek out the real martial arts. He is a much valued member of the club, with all his hard work and efforts being appriciated by his fellow students.